No. 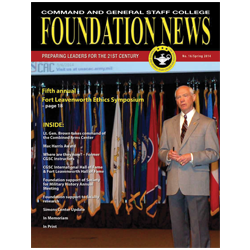 16/Summer 2014 (June) | Command and General Staff College Foundation, Inc. 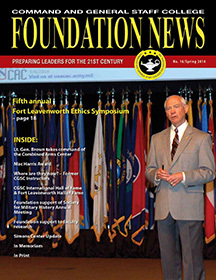 The 16th edition of the CGSC Foundation News comes at a very busy time for the Foundation. With new Foundation and College leadership we are forging ahead to make a difference in developing leaders of character and competence for future service to the nation. We also salute our outstanding faculty and have devoted this edition’s “Where are they now?” feature to two outstanding former instructors…plus much more. Enjoy this edition.